If there is one thing that is an essential part of summer, it is being able to escape from the heat of the day into a cool room where you can relax in comfort. That is not to say that the warmth should not be enjoyed, as it absolutely should be. But while the summer is a welcome respite from the cold and wet weather of the winter, there are times when the heat can get a little overpowering, depending upon your local climate of course. Being able to escape the heat when you need to is important as well as one of the conveniences of modern life thanks to our ability to create the climate we want inside our homes and work places. It you live in a climate that gets very hot and sticky in summer, then some means of keeping cool indoors is a must. Unfortunately, the very thing that you need to keep your home cool, with is an air conditioning system of some description, can work out very expensive to run, never mind install if you have none to begin with. But it doesn’t necessarily need to be that way when you think smart. 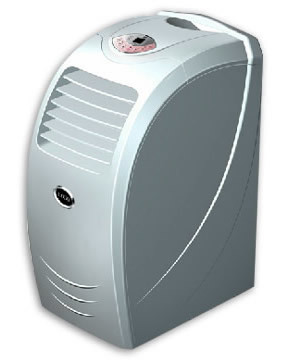 Instead of paying out many thousands of dollars for a full house-wide system, there is the rather more inexpensive option of buying one small, compact, portable air conditioner or more that you can simply move from room to room as you move around the house. These units are inexpensive to buy and similarly inexpensive to run when compared to a full system. It also makes sense from a usage point of view, because you only need to cool the room in which you are occupying at the time. There is no point in paying for all that power to run a system to keep a bunch of rooms cool where no one is actually using them. If you have a very dry climate with low average humidity, you can save even more money by opting for evaporative cooling in place of AC and still enjoy a comfortable interior climate for a fraction of the power consumption. But that's a concept I'll be covering in more detail in its own article. In the end the best way of balancing your household budget is to go for the size of cooling output that equates to the needs of the people that will be using it. Unless you have a large family where there is going to be more people using more rooms, a portable unit is a much more logical choice for keeping yourself comfortable when the temperatures soar. Modern portable aircon units are also very quiet when running, so you can even have one in your bedroom to keep you comfortable while you sleep, which is another good reason to have a means of reducing the inside temperature of certain rooms in your home in summer. So make sure you are comfortable this summer while keeping your costs and overheads down to sensible levels so that keeping cool doesn’t end up making you hot and bothered when your summer power bill appears in the mail. Comfort can be had at any price, so make sure you get yours at a price that you can afford this summer!